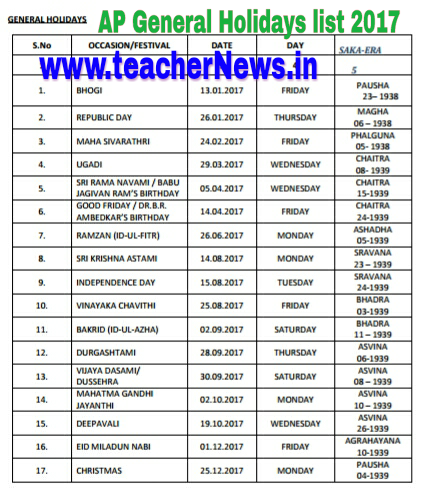 AP list of Holidays 2017 AP GO 2412 General Holidays and Optional Holidays for the year 2017 Declared. AP Government Official Optional Holidays and General Holidays list Download. AP Govt. declared Public holidays for Schools, Offices and Public sectors. Andhra Pradedh General Administration (POLL.A) Department G.O.RT.No. 2412 Dated: 24-11-2016.